Kindergarten friends - Playing in a band together - Making and experimenting with music together - And now performing in front of as many as fifteen thousand people and producing on renowned labels like RAM, Fokuz, Viper, etc. These guys have definitely come a long way. A long way, indeed. From sipping on Tea [with some Sugar, of course] in the attic room, fidgeting with tunes, probably a little unsure of things; to starting their own label, and being one of most promising acts, with a clearer brighter futures. Sounds like quite a journey, doesn't it? 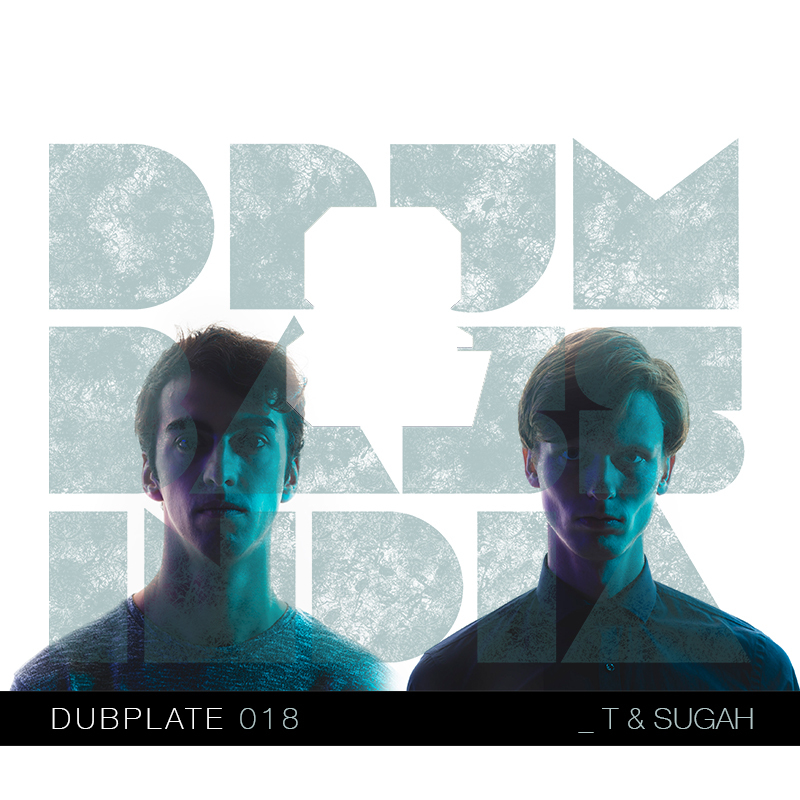 We at DnB India are screaming behind the screens, as we bring to you a small talk [along with an absolute banger of an exclusive set] we had with Philippe and Robin, the guys from the remarkable duo, T & Sugah. Our 18th and very first Dubplate feature of the year 2017. 1. Hey Robin, Hi Philippe, how are you guys doing? Happy New Year to both of you from us at DnB India. We do know about the story of how you guys came up with this cool name, tell us how T & Sugah evolved and the story behind the choice of music? A - Hey guys, thanks & best wishes to you too! Well, from around the end of elementary school we we’re already totally into music, playing keys/guitar in bands and stuff like that. I even recall the time when we made a song together to mock our teacher when we were 11. When we were 18 we started producing electronic music. What many don’t know is that before producing drum & bass we were actually making and playing Dubstep and House. For a while we did Dubstep-only sets, but gradually we started playing more and more Drum&Bass in our sets. We loved the energy and the effect it had on the crowd when we sped up the tempo and unleashed those DnB bangers! When we fell in love with the genre we also started taking our music career more seriously. A while after that we got an upload on Liquicity and from that moment on the ball started rolling! 2. What do you feel about the Bass scene in your country and what are your thoughts on its evolution so far? A - At the moment the Dutch Bass scene is literally exploding, new events & artists pop up on a weekly basis. Besides we have parties like Liquicity taking it to a whole new level with a massive two-day drum & bass festival. Next to that we also started our own club-night called “High Tea”, which is doing amazing! So clearly, we are really happy with this healthy evolution of the scene. 3. RAM Records, Viper Recordings, Hospitality & Liquicity. How does it feel to release on these renowned labels in the game? Also, how do you think it has benefitted your careers or affected your work style, etc? A - A Well every single one of those labels have provided us with a great platform to push our music to reach more and more fans! Therefore each have had a massive impact on our career! Sometimes when we think back we realise what an amazing achievement it is to have your own music on these labels. Ever since the beginning we’ve always been HUGE fans of these labels. If you told us 3 years ago we would release on these labels we would probably laugh in your face! 4. What were the milestones for T & Sugah in the year of 2016 and what’s in store for 2017? A - That’s a difficult one, there were so many! But if we had to choose, we’d pick the the start of our own label “High Tea Music”! To start your own label and label night is an exciting journey. There is so much good music that gets too little attention, it feels amazing to push these tracks and give these new producers a stage to perform on! The other milestone would be our first release on Hospital Records! Hospital has been one of the leading DnB labels for many years and we feel honoured to belong to the select group of artists to release on this imprint. For us, it’s basically a dream come true! 5. What is your studio / live / DJ set-up? A - Nothing too fancy really! In the studio we work in the box, so no analog gear. We build our own pc and produce with FL studio, we love the fact that you can do everything your own way in FL. We Just use a simple Focusrite sound card and Krk monitors. By the way, we do have a couple of midi controllers/keyboards and also guitars we record sometimes. One of the best investments has been treating my room with rockwool panels, so I don’t have annoying reflections anymore. On stage we like to use the CDJS Nexus 2000s, we prefer to have 4 decks since we really like to fit a lot of good music in each set. 6. Can you list 3 tunes you are feeling right now. The drop always gets the crowd completely, such a banger from Urbandawn! An amazing liquid track from one of High Tea Music’s prodigies! We love to break the constant flow of DnB in our sets with some Future Bass, and this one does the trick every single time! 7. What is the best gig (club/festival) you have played so far. In terms of Sound Systems, Venue and Crowd Response? A - Well the infamous Rampage party was by far the most bizarre experience we every had. I mean it doesn’t happen every day that you play for an sold out stadium holding 15,000 peeps! Such an amazing feeling! But if we are talking crowd response, Liquicity is the one. The vibes there are surreal, best crowd in the world! 8. What's the funniest / craziest thing that has ever happened to you during a gig? A - Well, the craziest was clearly the wall of death we pulled at Laundry Day in Belgium when playing b2b with our mates from NCT & MVE. It was in a tent filled with 3000 peeps, and everybody participated! You could literally feel the ground shake when the two masses collided at the drop! 9. You guys just found out that your last gig ever is tomorrow, what would be your closing track? A - We would probably go for “T & Sugah x Lexurus – No More”, since there would be no more T & Sugah! Otherwise we’d choose “T & Sugah – Get Mad”, this is definitely the one track that destroys the dance floor best! Not to forget the fact that we’re probably “mad” ourselves because we don’t like it at all if our last gig ever would be tomorrow! 10. If you guys were to travel to India, what are the first few places you'd love to visit and see, as tourists? A : Obviously all the standard touristy stuff like visiting the Taj Mahal etc. However it is becoming a bit of a tradition for us when we’re in foreign places to simply leave the hotel room and explore the city. That way you get the best impression of the culture and it feels a bit like an actual adventure! Oh, and we’re always looking for locals to give us a proper tour. So if would be wonderful to come by for both music and sight seeing. Hit us up!